Here’s the Bryant auction link! 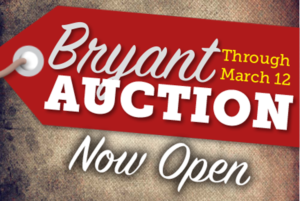 The Bryant online auction is now OPEN! It will be open all week and close at 10 p.m. on Monday, March 12. That gives you plenty of time to check out all of our offerings and bid, bid, bid. Remember, it’s all in support of Bryant’s PTSA. So get in there and have some fun! You can also share this link with your friends and family, even if they’re not Bryant families. Everyone is welcome to participate!